Sometimes you just have to embrace being a tourist, even though nothing makes me unhappier than following the crowd while on vacation. 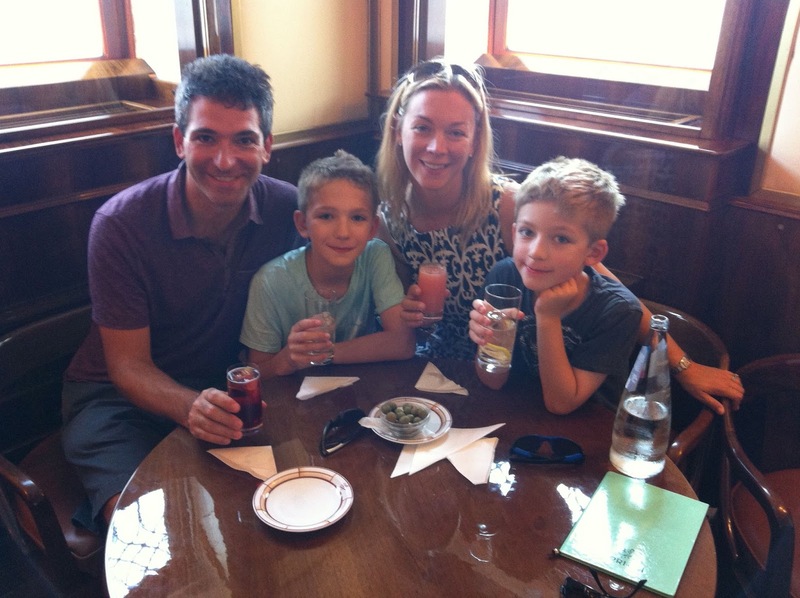 If you're in Venice this means you must go on a gondola ride and you must have a bellini at Harry's Bar. Neither of which will live up to your expectations, but you aren't allowed off the island until you've checked those off your list. 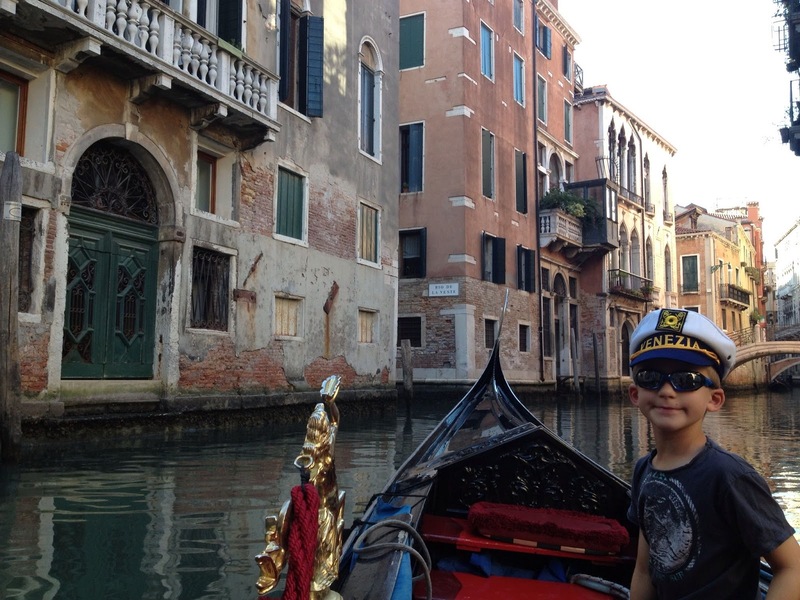 Gondoliers are part of the Venetian legend and last summer the little C&Gs asked us once an hour when we were going to go on a boat ride. As it was at least 100º the entire time we were there the answer was usually "later". But on our last day we realized there was no way the little C&Gs were letting us back on the vaporetto (water bus) to the tronchetto (parking garage) without a ride on a gondola. Guide books advise you to haggle with the gondoliers, but it's hard to play nonchalant with two bouncing boys both wearing gondolier hats. They saw us coming from across the narrow alley and were happy to charge us €100 (roughly $125) for the pleasure of a half hour spin around the lagoons. 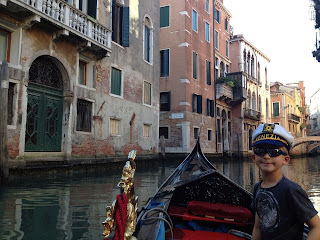 The boys loved it, and I have to admit it was magical to see the ancient and sinking city from the canal perspective. The only way to follow up an overpriced and overhyped (but entirely necessary) boat ride is with an expensive cocktail at the world famous Harry's Bar. We actually stumbled past it on the walk back to our hotel and I decided we needed to go in for a cocktail. With the mercury still climbing, even towards the end of the day, the frosted glass double doors of Harry's Bar looked very inviting. The clock had just struck 5:00, and from 5:00 to 6:00 they are a bit lax with their dress code. Shorts are not allowed after 6:00, and I'm guessing neither are little boys in shorts and sweaty t-shirts but we assured them we would be gone by the shorts witching hour. My bellini was good, as was Mr. C&Gs Negroni, although we've certainly had better elsewhere. But I will admit it was fun to have the blend of white peach puree and Prosecco in the place where it was invented, and our €50 bar bill was almost worth the hour of cool air conditioning.